Do you need to know about Schema Export and Import for SAP Business One, version for SAP HANA? SAP Business One Support are happy to share! Depending on your specific needs, you may need to create information models, tables, or stored procedures on a schema. This is usually done in a development system or you may want to reuse these customized objects. Instead of recreating everything in a different system, you can simply export the schema from the original system and then import the schema into the target system. 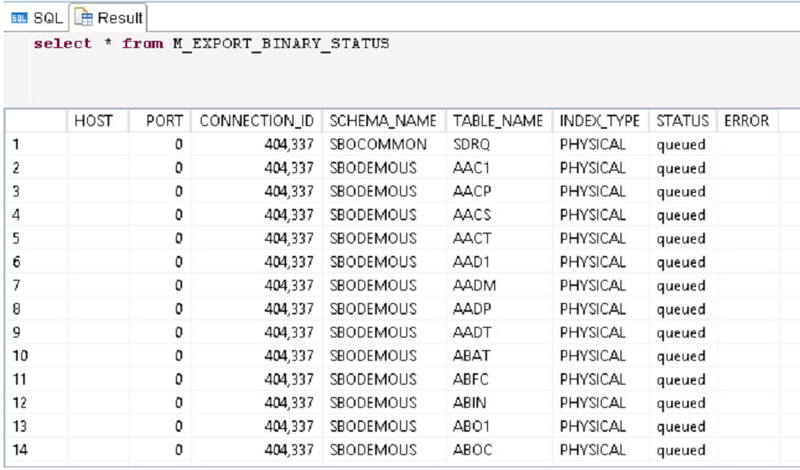 This article explains how to export and import schemas in the SAP HANA Studio as well as some additional information on troubleshooting and SAP Business One Backup Service. Most importantly, please note, that schema import-export is not the equivalent to a full instance backup and recovery. A regular full instance backup must be performed. This point is further explained in SAP Note 2121486 (S-User login required). Recommendation: Use “WITH IGNORE EXISTING” clause in the import command. Using “WITH REPLACE” clause may lead to data loss for dependent objects as it might overwrite/erase any existing dependencies in target system. In the SAP HANA Studio, open the administration console of your system. On the Trace Configuration tab, click the pencil icon (Edit Configuration) to edit the database trace. 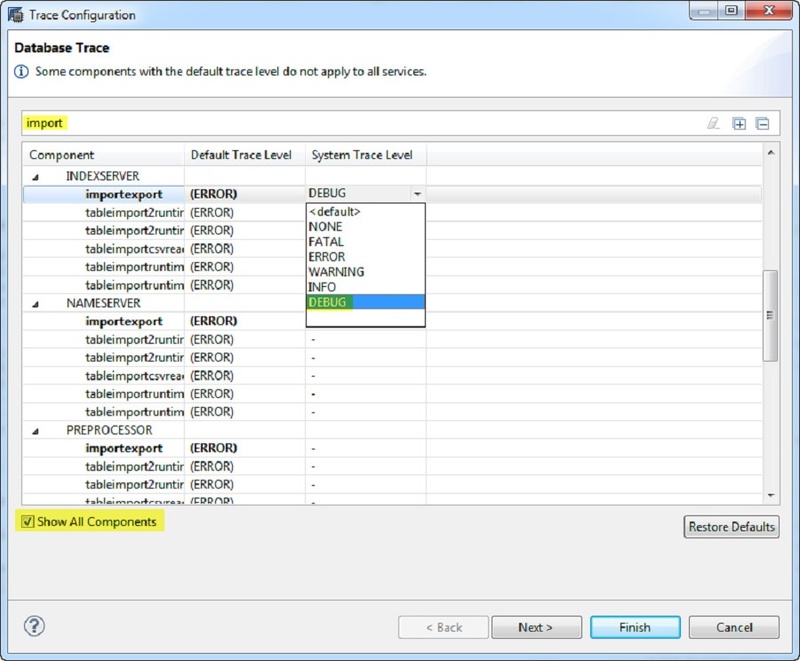 In the Trace Configuration window, select the Show All Components checkbox. In the search bar, search for “import”. Scroll down to the “INDEXSERVER” service. Set the system trace level of “importexport” to “DEBUG” for the indexserver service. To save the configuration, choose the Finish button. 2. Perform the import or export again. 3. In the SAP HANA Studio, in the administration console of your system, on the Diagnosis File tab, find the latest indexserver or indexserver_alert trace. 4. Open the trace file and look for the error message at the end. 5. After completing the investigation, change the importexport trace level back to ERROR. 458857 w ImportExport ImportExport.cpp(07382) : Data import skipped! As of release 9.0 PL14 and 9.1 PL04, SAP Business One, version for SAP HANA provides a backup service with a graphical user interface in the System Landscape Directory (SLD). This backup service automates and simplifies the export and import processes for your company schemas. An introduction video clip is available on YouTube. SAP Business One Support recommend using SAP Business One Backup Service over the manual export and import commands. Enhancements of the backup service are gradually introduced in different patches. For best practices and known limitations, please refer to SAP Note 2072868 (S-User login required). Caution: The schema import-export function provided by the backup service is based on the same SQL statements as manual import-export. You should be aware of the limitation of schema import-export, as outlined in SAP Note 2121486 (S-User login required). Regular full instance backup is required for system recoverability – the backup service provides the instance backup function as of release 9.1 PL05. RSP for SAP Business One, version for SAP HANA: In Remote Support Platform for SAP Business One, version for SAP HANA 3.1 patch level 07, you can setup backup scheduling for schema import-export and instance level backup. 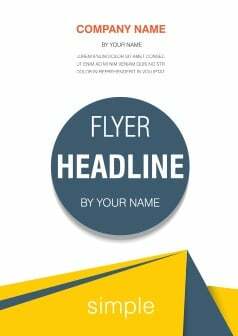 For more information please refer to SAP Note 2157386 (S-User login required).